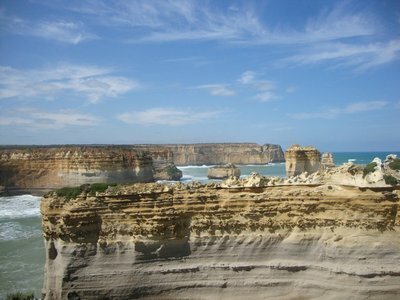 Only showing entries about loch ard gorge from Sustainable Travel. 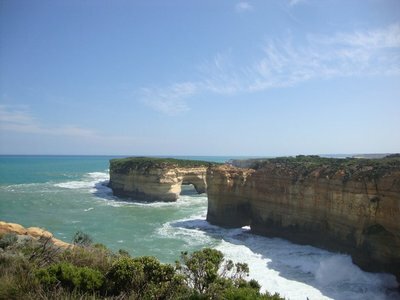 View entries about loch ard gorge from all Travellerspoint blogs. South-west Victoria, Australia. Hitchhiking, camping and hiking. 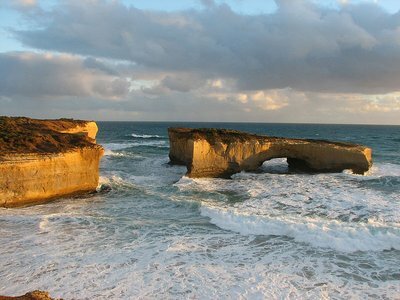 It must certainly ring a bell when you hear someone mention "The Great Ocean Road". If it doesn't.. What if I mention the Twelve Apostles? Does that sound familiar? Well, as we’ve experienced last week, pretty much the whole world knows about it and it is THE major tourist attraction in Victoria, Australia. Tour buses of every size cramped full with little Asians passing us by every minute, while we are standing on the side, of what for the most part is a one lane windy 243 kilometers (150 miles) long coastal road, with our thumbs up in the air. It stretches from the cities, Torquay and all the way west up to Warrnambool. The road was built by returned soldiers and is the world's largest war memorial, dedicated to casualties of World War I. Honestly, nobody really talks about this important historical detail. 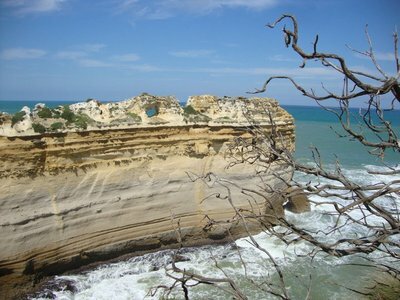 What the GOR is famous for is the limestone rock formations, which are slowly crumbling into the ocean. There aren't really twelve apostles, it’s more like 8. In recent years, a couple of these important landmarks collapsed, one actually with tourists still one them. The London Bridge incident anecdote was told to us by a friendly local giving us a ride. Now called the London Arch, cause there’s no longer a connection with the mainland, that’s the part that gave way in 1990. No one was injured, but it left two tourists stranded until a helicopter came to rescue them. 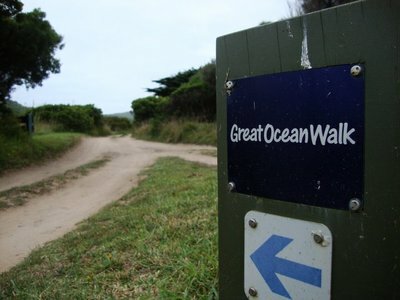 Originally we would have liked to walk the Great Ocean Walk. A 104 km walk starting in Apollo’s Bay almost all the way up to the Twelve Apostles. Instead we chose for a combination of hiking and hitchhiking. It turned out to be a very eventful 3 days, filled with amazing sights along the way and unexpected experiences. The first day was spent trying to get out of Melbourne as quickly as possible. We used public transport to get to Torquay, the start of the Great Ocean Road. Bell’s beach, a world famous surf beach was the first thing to check out. The weather was perfect for surfing and we did get to see locals have a try at some nice tricks. Our first ride was with a surf dude, with his over-friendly pup in the back of his 20 year old van, just making his way back home from Bell’s Beach. I thought that suited the start of our trip. There are a couple of free camp sites along the way but they were mostly located of the road for quite some kilometers. Finding camp spots wasn’t an issue. Rides on the other hand proved to be a bit more difficult. Lots of tour buses and tourists in rentals. We basically relied on locals to give us rides and they did, only our waiting times were a bit longer than what we were used to. 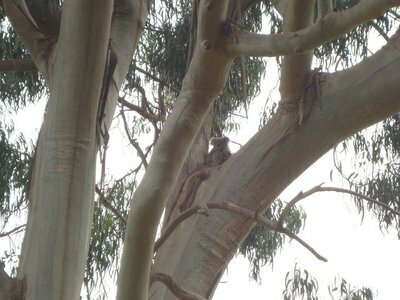 One goal I had set out for myself was to spot some koalas in the wild. There are heaps of them to be found around the Kenneth and Wye river area and the Otway National park. So we got a ride into Wye river with a local delivery guy and he told us to go to the back of the camp grounds and look up in the trees. And there they were. My first koalas! 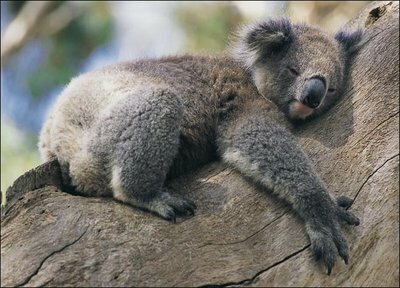 They’re usually found hanging around or dozing off in the bigger eucalyptus trees. 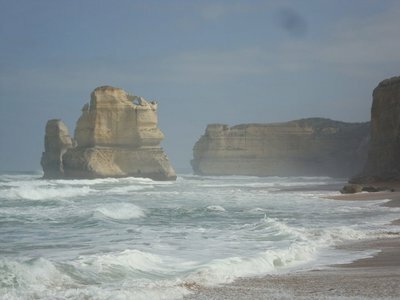 We had to do at least a part of the Great Ocean Walk and decided to tackle the last bit towards to Twelve Apostles. We started at the beginning of Port Campbell National park, where all the good stuff is to be found. The sky finally cleared up and it was the perfect day for a much needed photo shoot of the most important part of the GOR. After about 7 kilometres of walking along the magnificent cliffs (with all of our stuff on our backs going up and down the whole time may I add) overlooking the Great Southern Ocean, the Twelve Apostles came in sight. 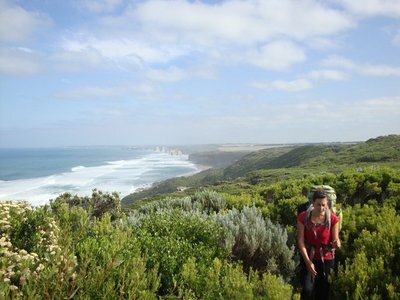 Unfortunately the Great Ocean Walk doesn’t go all the way up to them, so we had to hike a bit along the highway. The first big sightseeing stop of significance was the Gibson Steps. 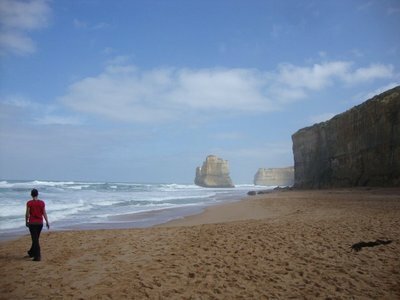 They take you down to the beach, so you can really admire the height of those cliffs and some Apostles in the distance. If the tide is out enough you can walk along to the rest of them, keeping in mind you have to get back in time, there’s no way back up on the other side of the ridge. (I actually think there were signs and it wasn’t really allowed, but we saw folks doing it.) Hitchhiking from one point of interest to another (as they are quite close to one another) wasn’t that hard. It has to be said though the place was over-run by tourists so we didn’t get rides that fast. Finally we made it to The Twelve Apostles! They are pretty impressive to see from close by and it was all definitely worth it. Even though we still think it has nothing on the Washington coast though. 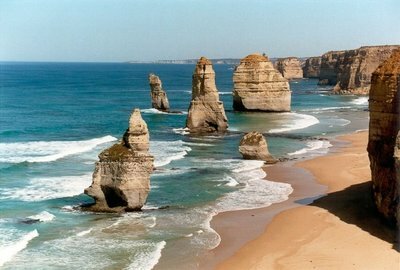 We should start calling it the Ten Thousand Apostles and rename the 101, The Great Wild Ocean Road. The next amazing place was The Loch Ard Gorge. The gorge is named after the ship "The Loch Ard", which shipwrecked at this location. There still is a cemetery you can go visit there. An extensive walk all around the place is highly recommended. Some incredible formations make for some very interesting views. The Great Ocean Road and all of it’s wonders ends officially in Warrnambool. There is still much more along the way to see only we didn’t have a vehicle at our disposal, so we had to be content with what was accessible to us and take the rides that were offered to us. In conclusion, everybody knows what The Twelve Apostles are and would recognize them in photographs. Well having seen them with my own eyes (and we worked hard to get there by hiking the last part of the Great Ocean walk), I can honestly state that the whole area is damn spectacular and they are truly one of a kind. Another great little adventure completed successfully.